The Dollar/Yen bulls were nowhere to be seen on Friday while US major indexes soared to their highest for this year, ending the week with solid gains. Investors usually follow the Equities market for any guidance on this pair, but the US Dollar lacked momentum against the Japanese Yen after US President Trump said that they are closer than ever to reach a trade deal with China, adding that he is willing to extend the truce period beyond March 1st. Preventing the Japanese currency from appreciating, data released these last few days pointed for a continued slowdown in the local economy. Earlier this morning, Japan released Machinery Orders for December, beating expectation by -0.1% vs -1.1% from a previous reading. 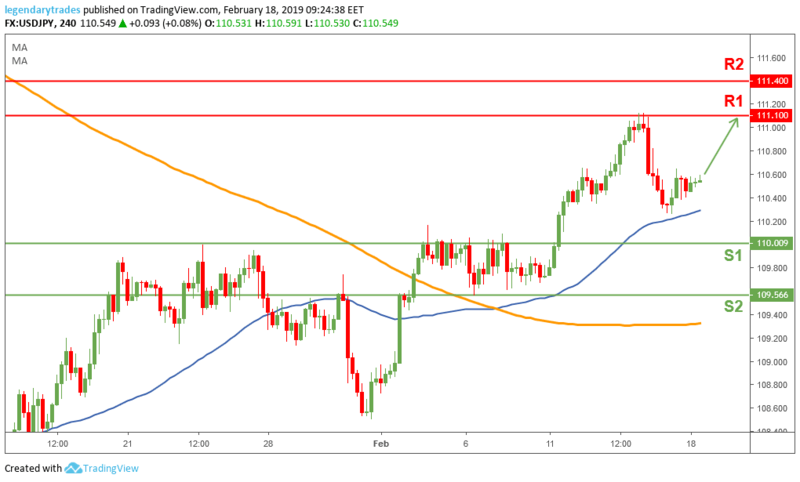 After failing to break above 111.10 (R1) resistance level, the Dollar/Yen pulled back and it is currently trading above the 50-day moving average (blue line). Price action looks bullish so far on the day, the bulls need any form of catalyst to send the price higher and retest 111.10 (R1). 110 (S1) is the support that keeps the bulls in control. Losing that level could change this pair’s overall bullish outlook.